Monterey Seabirding with SHEARWATER JOURNEYS Pelagic Birding for over 40 Years! Pelagic Gold with the Monterey Seabirding Pioneer! RESERVATIONS: Payment, in full by check or money order will secure your booking. Please include the name, home address, phone/email of each person in our part as required by the USCG. For reservation from outside of the USA, please contact Debi. Send reservations to: Debi Shearwater, PO Box 190, Hollister, CA 95024. Email: debi@shearwaterjourneys.com. Please see our blog for more information and updates. Welcome to Shearwater Journeys, the oldest pelagic birding company offering seabirding trips off California's central coast. Since 1976 more than 67,000 birders and marine enthusiasts have joined our trips from every state in the USA and more than 30 countries worldwide. We offer the most comprehensive selection of pelagic trips in the entire USA. The combination of deep water canyons close to shore makes this region one of the world's premiere seabirding hot spots. Offering the highest ratio of leadership in the business, we are second to none. Many of our leaders have been with Shearwater Journeys for several decades and have worldwide experience with seabirds. Our signature Monterey Bay trips have been the backbone of seabirding in North America, producing many "first" records. 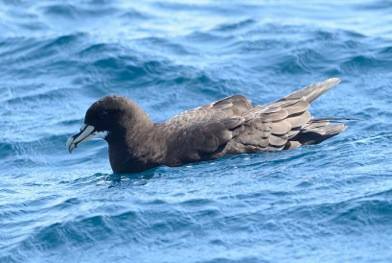 A few of the rare for North America, or California records have included: Short-tailed, Salvin's, White-capped, and Chatham Albatrosses: Great-winged, White-chinned, Murphy's, Hawaiian, Cook's, and Bulwer's Petrels; Streaked, Cory's, and Greater Sherwaters; Wedge-rumped Storm-Petrel; Red-billed and Red-tailed Tropicbirds; Northern Gannet; Brown, Masked, Blue-footed, Red-footed, and Nazca Boobies; Great Frigatebird; Long-billed Murrelet; Crested and Parakeet Auklets. Our twelve-hour Albacore Grounds trip departing from Monterey also sells out every year. Book early! Without a doubt, the marine mammal show, especially at Monterey Bay is one of the most spectacular in the entire world! The LAST YEAR— Yes, it is true— after 44 years of offering pelagic trips, I am retiring! The fall season of 2019 will be my last one at sea. I gratefully acknowledge the thousands of birders who have joined me, and the hundreds of leaders who have worked so diligently to bring the marine world alive to so many birders. I hope you will join me this season, the last one. Our trips to the Farallon Islands have a 100% success rate in finding Tufted Puffins, and always sell out early. Departing from Sausalito on a very stable catamaran, we sail under the iconic Golden Gate Bridge for a unique perspective. 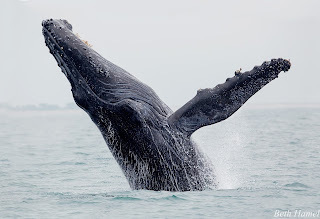 Monterey Bay trips this past fall season were over the top with seabirds and lunge-feeding and breaching HUMPBACK WHALES. Every single day is completely different - just ask the folks who did 5 trips in a row from Monterey with us! Our friendly and knowledgable leaders are ready to enchance your day at sea! Join us! Please check out our complete schedule of trips. Of course, I'll be on board every trip! Sign up for our news and discounts! Stay up-to-date with the Shearwater Journeys' email. You'll enjoy the latest updates to the website and qualify for trip discounts. Our list is never sold or shared with third parties.